or view map at the end of this web page. In an effort to provide the visitor (Mason or non mason) about the rich history that has taken place in our city this “Masonic Walk” was created. The intention of the “Masonic Walk” is to show the person or persons taking it to get a sense of pride due to the events that took place so many years ago by our forefathers who helped shape our rich history and America as we know it today. This tour is not found on any “Tourist Guide’s Map,” that is presented by any one in Charleston. The tour comes complete with a detail of events that happened at each stop along the way along with a map. It was put together through many years of research and information gathered. When you take this tour keep an open mind and if for some reason you want to you can always travel it again at a time of your own choosing. The tour starts at the at the sight were Colonel John Mitchell is know were to live at on, “17 Guignard Street.” The tour will end at St. Michael’s church with you standing in front of Ill. Brother Frederick Dalcho’s grave. 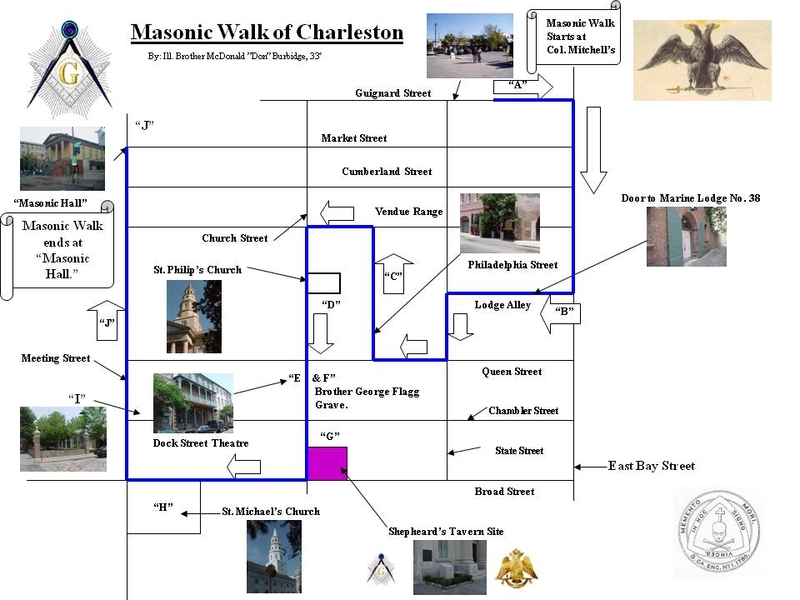 In an effort to provide the Mason or non-mason about the rich history that has taken place in Charleston, S. C. the “Masonic Walk” was created. The intention of this project is to show the person or persons taking it to get a sense of the events that took place so many years ago by our forefathers who helped shape our rich history and America as we know it today. I am very proud to say that this tour is not found on any “Tourist Guide’s Map,” that is presented by any one in the Charleston area. The tour comes complete with details of events that happened at each stop along the way with a map to guide you through the city streets. It was put together through many years of research and information gathered. The first documented mason to arrive in Charles Town as it was then called was Brother Thomas Whitmarsh who was a printer, and by Brother Benjamin Franklin’s office that was located in Philadelphia. He left Philadelphia on September 9, 1731, for Charles Town, S.C., with equipment for a printing office to be established there. It is to Brother Whitmarsh that we may trace the introduction of Freemasonry in South Carolina. Although there is no known records that survive today it is strongly believe that an uncharted Masonic lodge existed in Charles Town before 1735 when Solomon’s Lodge No. 1, was given a charter from England. At this location were we will start the “Masonic Walk.” It is at this point that Colonel John Mitchell lived at with his wife and his mother-in-law Mrs. Cruger lived across the street. During the merger talks of the Ancient and Modern Grand Lodges Colonel Mitchell played an important role in the various committees that meet to make it happen. When President George Washington arrived in Charles Town for a visit it was Colonel John Mitchell who entertained him at the “Orphan House,” that was located on Calhoun Street. Both of these Brothers were also very close friends during the Revolutionary war. On May 31, 1801, Colonel John Mitchell and his good friend Dr. Frederick Dalcho established the Supreme Council at Shepheard’s Tavern that was located at the corner of Broad and Church Street. This was to be the first meeting in America of the Supreme Council. Councils are held at the house of the Grand Commander at Meridian [noon], every third new Moon, reckoning from the new Moon in May. It is at this location were Colonel John Mitchell lived at in Charleston, S.C. The house he lived in is no longer standing here but we now know another location that the Supreme Council met at other than Shepheard’s Tavern were it was established at on May 31, 1801. Colonel John Mitchell was listed as living at 17 Guignard Street at the time of his death. Paved in Belgian blocks, the alley was created by adjacent landowners to allow access from their homes on State Street to their ships and docks one block away on East Bay Street. It takes its name from the Lodge of Freemasons, First established in the alley in 1773. Lodge Alley is located in an area of the old walled city of Charleston where the French Huguenots once had warehouses and dwellings. Originally being very close to Charleston's wharf’s, Lodge Alley developed an 18th century seaport character expressed in taverns, storage warehouses, carriage houses, tables, lodges and corner dwellings. It was at Marine Lodge No. 38 that Charlestonians openly defied the British government before the Revolutionary War. On November 7, 1774 as a means of protesting the harsh treatment shown to Boston, Charleston’s Liberty Boys met in the Masonic Lodge-Room and constructed a “rolling stage” or parade float. Upon it effigies where the images of the Pope, the Devil, Lord North, and Governor Thomas Hutchinson of Massachusetts were displayed. The appearance of the float marked the end of a three-day period in which Charleston’s Tea Party was equally important as a symbol of defiance to British oppression as it was in Boston. When the “Grand Lodge of South Carolina, Ancient York Masons,” was formed by the five “Ancient: Lodges in Charleston, January 1, 1787, in which movement Marine Lodge, No. 38, was a prominent factor, it is a noteworthy fact, that at least three of the principal officers were Pennsylvania Masons, viz. Hon. William Drayton, Grand Master; Hon. Mordecai Gist, Deputy Grand Master; Edward Weyman, Esq., Senior Grand Warden. It has upon it a star of seven points, with the ineffable name in the centre, and the motto, “Memento Mori” the arch on two pillars, and the “All seeing eye” on the Keystone, the sun beneath the arch, and “Holiness to the Lord” for the motto; the cross and brazen serpent erected on the bridge, “Jesus Salvator Hominis” for the motto; on the fourth circle is the skull and cross bones, surmounted with the cross, “in hoe signo vinces.” The reference of the last three devices is evidently to the Royal Arch, the red cross and the Templar degrees, while the first is the symbol of the Lodge of Perfection, and hence they show the connection of the Order of Templary in this State at that time with the ancient and accepted rite. The charter that was created for South Carolina Commandery No. 1 is shown below. We, the High Priest, Captain Commandant of the Red Cross, and Captain General of the most Holy Invincible Order of Knights Templars of St. Andrews Lodge No. 1, Ancient Masons, held in Charleston, South Carolina, under charter from the Grand Lodge of the Southern District of North America, do hereby certify that our trusty and well-beloved brother, Sir Henry Beaumont, had passed the Chair, been raised to the sublime degrees of an Excellent, Super Excellent, Royal Arch Mason, Knight of the Red Cross, and a Knight of the most Holy, Invincible, and Magnanimous Order of Knights Templars, Knights Hospitallers, Knights of Rhodes, and of Malta, which several Orders are above delineated; and he having conducted himself like a true and faithful brother, we affectionaly recommend him to all the Fraternity of Ancient Masons around the globe wherever assembled. Given under our hands, and seal of our Lodge, this first day of August, five thousand seven hundred and eighty three, and of Malta 3517. Originally named Kinloch Court but in 1810 by William Johnson. His occupation was that of a Blacksmith and he owned much of the property in the vicinity. He was also a member of Orange Lodge No. 14. He was elected to numerous committees that also included Brother George Flagg (Solomon’s Lodge No. 1) and Brother Edward Weyman (Union Kilwinning Lodge No. 4) who were also respected masons of the day. During the Revolutionary war Brother William Johnson had been sent to Philadelphia as a prisoner. After his return to Charles Town he renamed it to, “Philadelphia Street,” in admiration of Philadelphia. As you walk down this historic street you will find that a modern day brick path has been laid down the middle of the street. On either side of the brick path is ballast stone that once cover the entire width and length of the Street. This street looks much the as it was when it was first made. About 1/3 of the way down the Street look up to your left and you will see a view of the steeple of St. Phillip’s church over the brick wall that runs most of the length of the Street. Also try to imagine the pistol duels of men protecting their honor and horse carriages traveling down it. This is the same church that our late Brother Frederick Dalcho was a rector of at one time. When the new edifice of the “Established Church” rose at the head of one of the town’s principal through fares, the street became known as Church Street as does the present building on the same site. On December 27, 1762 and again in December 1784 Right Rev. Robert Smith presented to the Masons of Charles-Town a Masonic sermon, which he called “Charity Sermon for the Masons No. 100.” This sermon is perhaps one of the earliest if not one of the first documented Masonic sermons of its kind presented in Charles-Town to the Masons. Right Rev. Smith also established the College of Charleston and the Society for the Widows and Orphans of the Clergy, which still exists today. Rev. Frederick Dalcho, M.D. and Colonel John Mitchell, was also a member of the Society for the Widows and Orphans of the Clergy. On Christmas Day, 1805, Rev. Dr. Edward Jenkins married Dr. Dalcho and Mary Elizabeth Threadcraft in St. Philip’s Church. This was Dr. Dalcho’s second marriage and his wife was to survive him until December 12, 1852. There were no children, from this marriage. During the summer months of 1814 our late Ill. Brother Frederick Dalcho, M.D. officiated at the church as Rector for the summer months until a new Rector could be found to fill the vacant spot left by the untimely death of Rev. J. D. Simons. Buried in the graveyard of St. Philip’s church you will find the grave of Ill. Brother James Moultrie, Sr. who was a founder of the Supreme Council and the gravesite of Right Rev. Robert Smith. In 2000 a grave marker was placed on Dr. Moultrie’s grave which also names him as a member of the founding fathers of the Supreme Council. On May 11, 1774, for the benefit of a charity fund raiser for the masons a play was performed at the “Dock Street’ theatre which was named, “Cato,” that was performed by the American Company. At the end of Act I “A New Mason’s Song,” with a chorus was sung. The doors of the theatre were opened at 5:00P.M. and the play was started at 6:00 P.M.
At the time of this play Union Kilwinning Lodge No. 4 owned the building. The pupils of Mr. James Thompson again repeated the play on July 1, 1774. It was later said that Union Kilwinning Lodge No. 4 were very happy to lend the building to the pupils to perform in. Located directly across from the Dock Street Theatre. In 1774 in Charleston some of the locale artist made money by painting houses. Listed among these was Brother George Flagg who was a member of St. John’s Lodge No. 31 (Ancient), which is the same lodge that Dr. Frederick Dalcho was a member of. Brother Flagg at some time later joined Solomon’s Lodge No. 1 which was a modern Masonic Lodge. From its organization, in 1736, Solomon’s Lodge No. 1, continued uninterruptedly to work until 1811, when it suspended labour, at which time Brother George Flagg, the only remaining member, placed in the hands of the Grand Treasurer ninety-six dollars of funds, to be kept in trust by the Grand Lodge until the resuscitation of the Lodge. In 1817 it was revived, but again became dormant in 1838. The portraits that Brother Flagg painted were those having to do with historic moments. His painting can be seen in various museums around the world with one being located in Paris at the Louvre. It is due to one of his portraits that we know the image of Brother Edward Weyman who was responsible for establishing the first Ancient Lodge (Marine Lodge No. 38, Ancient) in Charleston. When the meeting were taking place among the Ancients and the Moderns of 1809 to merge both Grand Lodges into one Brother Flagg is seen as an active member who worked hard on the committees. 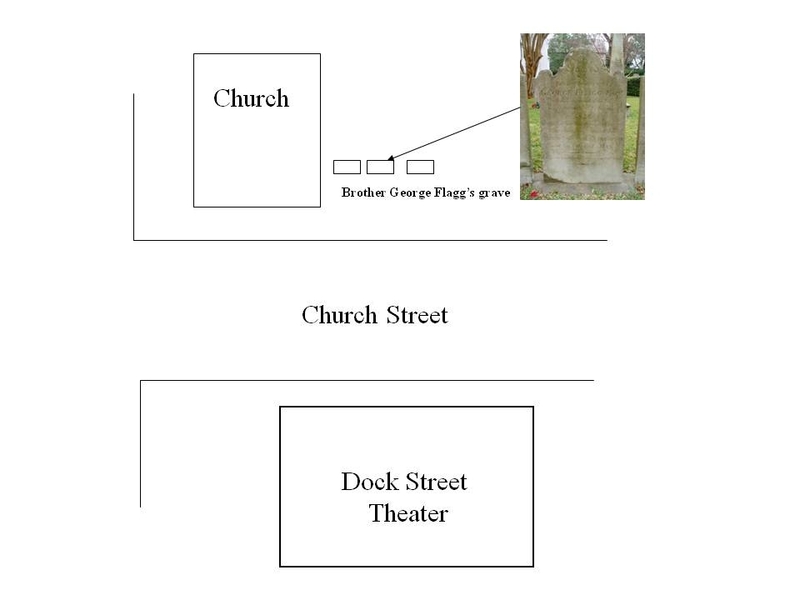 He is buried in the graveyard of the French Protestant Church, which is located directly across the street from the Dock Street Theatre. His grave is located on the first row in the centre. Site of Brother Charles Shepheard's Tavern, also known at various times as Swallow's Tavern, The City Tavern and The Corner Tavern. At this location occurred many historically important events. One was the organization of one of the first Masonic lodges and of The Supreme Council for the Scottish Rite Masons for the entire United States. Solomon's Lodge No. 1, Free and Accepted Masons, was organized on Oct. 29, 1736, at 'Mr. Charles Shepheard 's in Broad Street. ‘ The Ancient and Accepted Scottish Rite of Freemasonry, was organized at this same location in 1801. The first record of a theatrical season in Charleston, and one of the first in the country, was announcement in the South Carolina Gazette, Jan. 11, 1735, that on the following 24th, a tragedy called The Orphan, or the Unhappy Marriage, by Thomas Otway, would be "'attempted'' in ''the Courtroom.'' The ''courtroom'' was the long room of Shepheard's Tavern, which was rented for several years prior to 1738 to the provincial government for meetings of the court, since the Province had no suitable building and the Governor and Council could not agree on where one should be built. The use of the same room for court sessions and entertainment’s was not unusual. A dancing master, Henry Holt, gave a ball in the Courtroom a month before The Orphan was presented there. (The Orphan was not the first theatrical production in Charleston. Tony Aston, an English actor, in 1703, wrote and acted what was probably the first professional dramatic performance written and acted in the American colonies.) Shepheard's was also one of the city's post offices. In 1743, Charles Shepheard received and distributed mail arriving on ships and by land. In 1773, when the establishment was Swallow's Tavern, the first Chamber of Commerce in America was formed. Banquets were given for arriving Royal Governors at Shepheard's Tavern. The St. Andrew's Society, and other fraternal organizations in the city, held their meetings and dinners at Shepheard's. After the name changed to “The Corner Tavern” it hosted meetings of the Sons of liberty during the Revolutionary period. The name changed again to the “City Tavern” was burned in 1796 but was soon replaced. The tavern building was demolished in 1928 for the construction, in 1928-29, of the present building. The Classic style building faced with Indiana limestone, which cost $280,000 and was known as the Citizens and Southern Bank in 1906. As you stand on this corner try to imagine what it must have looked like back in 1801 when the streets were made of dirt, no traffic lights, power lines did not exist, and no cars traveled up and down the streets. Imagine if you can what it might have looked like on May 31, 1801 when each of the founders of the Supreme Council arrived to establish the first meeting of the Supreme Council at this site. Located in the graveyard under the “Big Oak Tree” near the wall facing Meeting Street you will find the grave of General Mordecai Gist who served under General George Washington during the Revolutionary War. After the war he settled down on a plantation to live near Charleston and was a Past Grand Master of Masons for the Ancient Grand Lodge along with being one of the original members that established the Society of the Cincinnati, which was established at Shepheard’s Tavern. When the first president of America George Washington (a known mason) made his southern tour through Charleston in 1791 he attended church services here at St. Michael’s. Many dinners were held in his honour to which two of them given to him were by the Society of the Cincinnati and the Ancient Grand Lodge of Masons. Rev. Frederick Dalcho who is another prominent masons is buried in this graveyard. 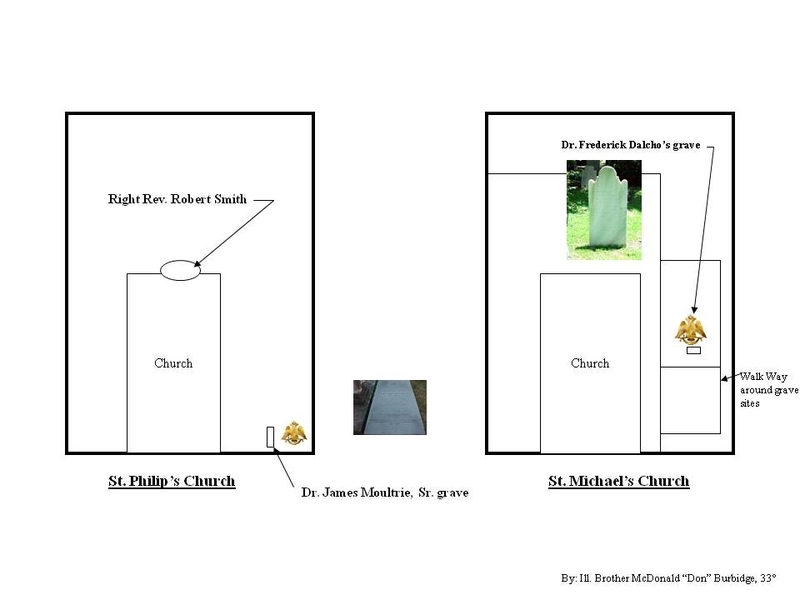 During the year 1811-1812, Dr. Dalcho and his wife owned pew number 89 at St. Michael’s church. The location of this pew is in the same location today as it was in 1811. On December 26, 1817, The Grand Lodge of South Carolina Ancient York Masons and the Grand Lodge of South Carolina met for the last time in two separate locations as two separate Grand Lodges in Charleston, South Carolina. On this same night they met together for the first time to elect the officers for the newly formed Grand Lodge. On December 27, 1817 the newly elected Grand Officers were elected under the title of, “Grand Lodge of Ancient Freemasons of South Carolina,” at Galloway’s Tavern. The first order of business was performed by Brother Jarvis H. Stevens, Past Grand Master of the old Grand Lodge of South Carolina who installed the first Brother Thomas W. Bacot as the first Grand Master of the newly formed Grand Lodge. After Worshipful Master Bacot installation he then proceeded to install his officers for the ensuing year. With the installation of the newly established Grand Lodge of Ancient Freemasons of South Carolina a prayer was given by the newly elected Grand Chaplin (Brother Frederick Dalcho) and the meeting was closed in due form. On December 27, 1817 the brethren of the newly formed Grand Lodge of Ancient Free Masons of South Carolina met once again at the lodge room located at Galloway’s Tavern. With the installation of the new Grand Master and the newly formed Grand Lodge it also brought harmony back to the brethren of Charleston that had for so many years was missing. Following a number of part-time associations with St. Michael’s Church in Charleston, South Carolina, Rev. Dalcho was retained as an assistant minister on February 23, 1819. In 1824 he established with others, “The Charleston Gospel Messenger and Protestant Episcopal Resgister”, a monthly journal of the Church’s activities. This paper was published monthly until 1853. His monumental work at this period was a history of the Protestant Episcopal Church in South Carolina, the first published history of any diocese in America. Consisting of more than 600 pages. All of Dr. Fredrick Dalcho’s books were sold at the, ”The Theological Book Store” in Charleston, South Carolina located at 51 Board Street. In a 1999 a letter was discovered which Dr. Dalcho who was the presiding Sunday School Superintendent of the children wrote. He asks the Church Warden’s for permission to locate a bookshelf in the balcony of the church next ti the bell tower door for the Sunday school children to place their Sunday school books on. Until this time it was not known what Dr. Dalcho duties were in the church. Ill. Bro. Frederick Dalcho, M. D. and his wife are buried in the graveyard of this historic churchyard. As you stand looking at Ill. Brother Frederick Dalcho’s grave read each word carefully on his marker that was erected in his honour from the Masons of Charleston. Of all of the known gravesites of the founders of the Supreme Council only on Ill. Brother Frederick Dalcho grave is it mention that he was a member of the Supreme Council until 1999 when the grave of Dr. James Moultrie was discovered. In 2000 a grave marker was placed on Dr. James Moultrie grave, which announces him as a mason and co-founder of the Supreme Council. Both Dr. Dalcho and Moultrie were members of Union Kilwinning Lodge No. 4 after the final merger of 1817 of the two Grand Lodges. Dr. Dalcho grave marker was placed on his grave by the masons of Charleston, South Carolina who held him in such high respect. “The Clergy of the Episcopal Church and of other denominations; the Members of St. Michael’s congregation, and of the other congregations of the Episcopal Church in this city, and the Friends and Acquaintances, are invited to attend the Funeral of the late Rev. Dr. DALCHO, from his house in Meeting street, This Afternoon, at 4 o’clock precisely. The Church, showing their due respect for their late Assistant Minister was draped in black merino. “Grand Lodge was ordered to be clothed in mourning for the space of six weeks” at its Quarterly Communication on the 16th of December. Located at the West end of Market Street was the newly built Masonic Hall to be used by the Masons of South Carolina. Built as a need to have a central location Masonic Hall for all the Brethren to attend. At Special Communication of the Ancient Freemasons Grand Lodge on July 13, 1835 the lot chosen for the Masonic Hall could be bought for a cost of $12,350.00. Soon after this meeting the Grand Lodge bought the lot. The building was designed by Mr. Hyde who was one of the first architects of the city was chosen for the task of designing and building it. 1) That the building be commenced within one year from the approved date. 2) That the lower part of the building under the arches be forever kept open as a market place. 3) That the Hall be so constructed as to be capable of accommodating large assemblies of the citizens, and be open free of charge for all general meetings. 4) That the fee simple of the land shall continue vested in the Council, but the Grand Lodge and their assigns be warranted in the use and enjoyment of the rents and profits to accrue and be derived from the buildings forever. 5) If for any reason the building is destroyed it must be rebuilt within five years from the time of the accident or the Grand Lodge shall forfeit all rights to rebuild. The corner stone laying for the new Masonic Hall took place on August 23, 1837. At the appointed time the Grand Master instructed the Grand Treasurer Brother John R. Rogers to place the customary memorials into the stone. At this location the following Masonic bodies met, Grand Lodge, Masonic Lodges, Scottish Rite, & the York Rite. When these bodies met here they also stored their “meeting minutes,” of their lodges at this location. On April 27, 1838 a fire broke out in the City. It started on King Street near the corner of Beresford Street and extended its rage in a North direction to Society Street extending to almost East Bay Street. Nearly one-third of the buildings in the city fell victim to this fire. Included in this great lost of building was the Masonic Hall, which was in the process of being built at this very site. At Seyle’s Hall the Grand Lodge and the Subordinate Lodges met also was consumed by the fire. As a result of this the entire records of Grand Lodge along with the Subordinate Lodges were destroyed. On Thursday August 24, 1837 published in, “The Southern Patriot,” was a short event of the previous days event. “New Masonic Hall. The Corner Stone of the new Masonic Hall, for the Grand Lodge of Ancient Free Masons of South-Carolina, about to be erected in Meeting street, fronting the Market, was yesterday laid with the usual masonic ceremonies. The different Lodges assembled at Seyle’s, at 5 o’clock in the afternoon, and on being joined by Council, they formed a procession, with music, to the spot, where, on arriving, the Right Worshipful Grand Master J. J. Alexander, Esq. Assisted by the other officers, first deposited several coins and newspapers, of the date of the ceremonial about to take place, and having then laid the corner stone of the new building, addressed the different Lodges in a manner equally eloquent and appropriate. On April 27, 1838, a fire broke out in the City of Charleston. It started on King Street near the corner of Beresford Street and extended its rage in a North direction to Society Street extending to almost East Bay Street. Nearly one-third of the buildings in the city fell victim to this fire. Included in this great lost of building was the Masonic Hall, which was in the process of being built at this very site. At Seyle’s Hall the Grand Lodge and the Subordinate Lodges met also was consumed by the fire. As a result of this the entire records of Grand Lodge along with the Subordinate Lodges were destroyed. This ends the “Masonic Walk” tour. If anyone has a question I will try and answer it to the best of my knowledge.